Why the puzzle piece pattern? The Story: The autism awareness ribbon is made up of puzzle pieces to show how puzzling and mysterious autism can be. The different colors and shapes show how all people with autism are different. The colorful ribbon demonstrates that there hope for a bright future for those individuals living with autism. Why the ribbon? : The pattern is eye catching and it will help people who know about autism speak about the subject with those people asking about the ribbon. After I typed most of these instructions up, I found that those embracing neurodiversity are sometimes offended by the pin. 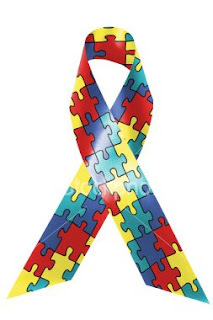 They think the pieces mean that those who are autistic are pieces that need to be put together. If you reference the story above, you'll see that that is not true. The pieces represent the mysteries of the condition. Materials Needed: Jigsaw Pattern Ribbon, scissors, glue gun and glue, pins made for such projects (should have a rectangular flat back), turquoise (aqua), yellow, blue and red craft paint, small puzzle piece puzzle pieces, and storage bins or plastic bags for finished product. If the plan is to make dozens of ribbons at one sitting then having enough volunteers to form an assembly line or (assembly stations) is helpful. 1. Make sure each ribbon cutter has a pre-cut ribbon for reference. Ribbons should be six or seven inches long. Cutting ribbons at an angle gives the ribbons an extra bit of style. Note: This job takes the least amount of time. Only one or two cutters are necessary. 2. Cover a table with newspaper or a large piece of cardboard to protect surface for paint. Put the bottles of paint in the middle of the table. Have each painter choose a color. This eliminates the need to constantly rinse brushes. A one-inch width sponge brush works best, although other types of brushes gets the job done too. Paint the cardboard side of the puzzle so that paint will adhere better. Two coats of yellow paint may be necessary for adequate coverage. Only one coat of all the other colors is needed. Each painter should have enough space to place finished pieces nearby for drying. Note: It only takes a few minutes for each piece to dry. Once dry pieces should be placed in a container and moved to a gluing station. 3. Make sure that the gluing station is placed by electrical outlets. Extension cords and a power strip may be helpful. The cords on glue guns seem to be relatively short. The finished product requires three dots of glue: 1. to shape the ribbon; 2. to glue on the puzzle piece; 3. to glue on the pin. It may be most efficient to assign those at the gluing table just one of the three tasks. Have a small plastic storage bin or one gallon Ziplock back on hand to contain the finished product. For gluing, position the strip so that the open edge of the loop is facing the back and the folded edge is facing front. A finished product on hand may be helpful as a point of reference. Use a drop of glue to hold the ribbon in place. Next, attach puzzle piece. Finally, glue the pin on. Decide which way is best to position pin. My group glues pin so that the point faces upward. 4. Decide how the pins will be packaged. Some groups, such as BBB Autism attach the pin (see their second step) directly to a laminated card with the puzzle pieces. Our group decided to glue the puzzle piece story on a sandwich bag containing a single ribbon. Note: The story is optional as it requires extra work and money. 5. Decide how much to sell the pins, if they are to be sold as a fundraising item. My group (located in the U.S.) will sell each pin for $2. Hope these tips are helpful. We had a fun time making these ribbons. It is a great support group activity!